I've gotten a bit jaded about "car of the future" designs, but I kind of love this scale model of the BMW of 2015, which won BMW's design challenge. Partly because it deconstructs the traditional image of a car, but mostly because it looks like a Cylon raider, sort of. 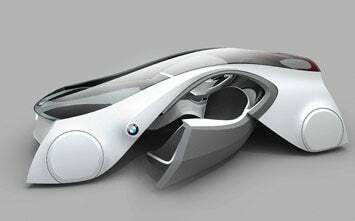 Students Jai Ho Yoo and Lukas Vanek, at Turin's Istituto Europeo di Design of Turin, designed the BMW ZX-6 to have swooshy lines, reminiscent of the ocean or the wind or something. Click through for a couple more images.